A Hurricane Mk Ib of 17 Squadron, Debden June 1940. The Mk Ib was the more heavily armed version of the standard Mk I Hurricane and carried the heavy armament, for the RAF of the day at least, of two 20mm cannon in the underwing pods and 4 0.303”mg’s in the wings. In the main they were used to attack the Luftwaffe’s bombers during the Battle of Brittan where their heavier armament proved far more effective than the standard eight 0.303” guns. Some eventually saw service with the Desert Air Force where their cannon proved quite effective against the lighter German and Italian armour seen in that theatre. 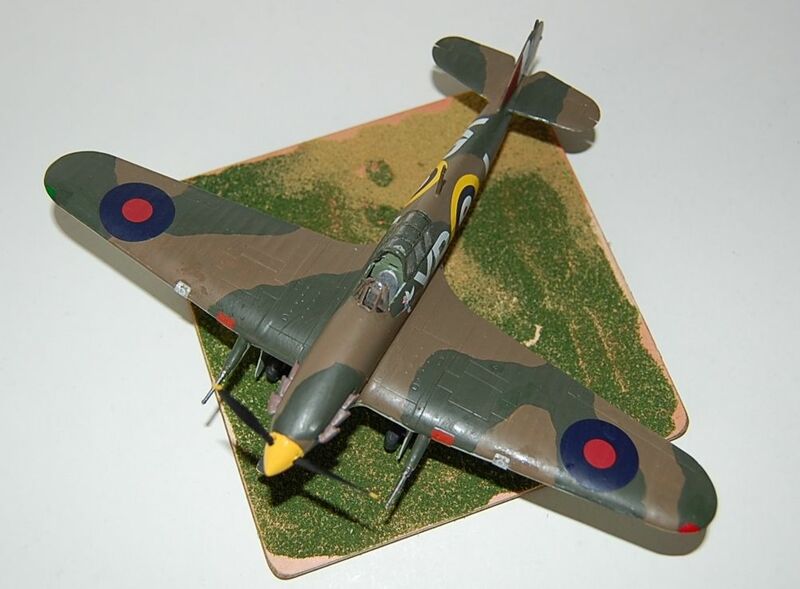 This is the Airfix rag wing Mk I with the addition of the Freightdog 20mm gun pods. This were actually trialled on the rag wing Hurricane but not proceeded with. 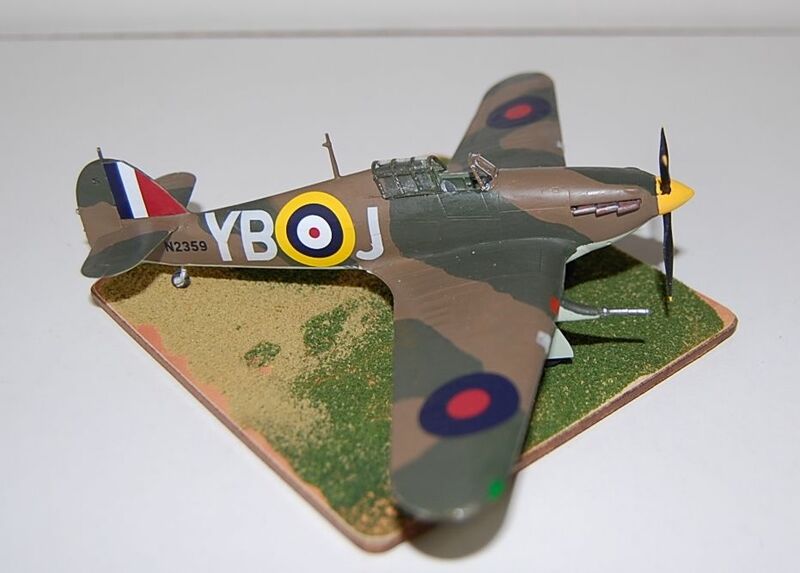 Paints in the main are my usual mix of Xtracrylic and Humbrol whilst the transfers come from Sky Models super value Hawker Hurricane sheet. I have a couple of these sets and very nice they are to. I was thinking of adding a pair to one of the Airfix Spitfire Mk I’s in the stash as a wif and then whilst looking at my Morgan and Shacklady’s “Spitfire the History” for something completely different noticed the piece on the proposed alternative cannon armament for the Mk I’s and saw that the fitting of these was actually proposed. Great minds or what ? very smart, Chris - well done. That's a MEAN looking machine there Chris, I wonder why they didn't proceed with it for real? Perhaps for the same reason the Spitfire Ibs were dumped, 'cos the cannons kept jamming? IIRC the cannon fitted to the Spitfire Ibs were made by Vickers, and the only way they could get them to work was to turn them sideways. 19 Squadron had the first Ibs, and they only had the two cannon, no .303s at all, and they were so useless the Squadron Commander demanded their old Ias back, and he got them! Yeah, that's what keeps coming to mind Kit, but also I'm thinking Oerlikon. I seem to remember reading something along those lines. As far as I know, ALL UK 20mm aircraft guns in WWII were Hispanos. The RAF evaluated the Hispano, several different Oerlikons and something else (Madsen?) pre-war, and chose the Hispano because it was the most powerful, whereas other air forces chose the Oerlikon MG-FF because it was easier to mount. 1. The gun was designed to sit in the V of a Hispano V-12 engine, and depended on the engine block for some of it's rigidity. Taken off the engine and mounted in a bendy alloy wing, it flexed to the point of malfuctioning, and much redesign of gun and mountings was neccessary to get it working. Much of this unsung work was done by Boulton-Paul. 2. 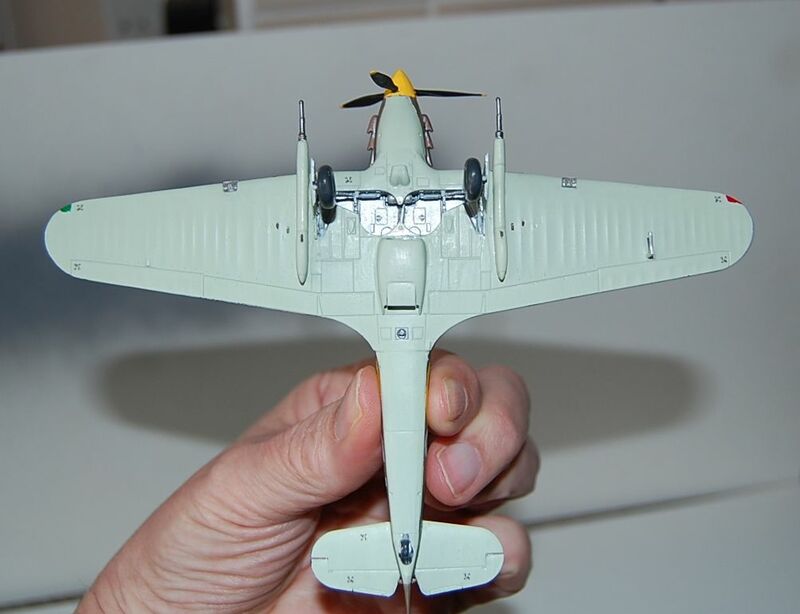 The original Hispano only fed from 60 or 100 round drums. This wasn't enough ammo and the drum made the front profile of the gun rather big. The installation on the Hurricane seen here had the gun in the gondola and the ammo drum in the wing. The sideways installation managed to get both into the wing (with a few bumps to cover sticky-out bits) but this only exacerbated the malfunctions due to mounting issues. Eventually a belt-feed mechanism was developed. 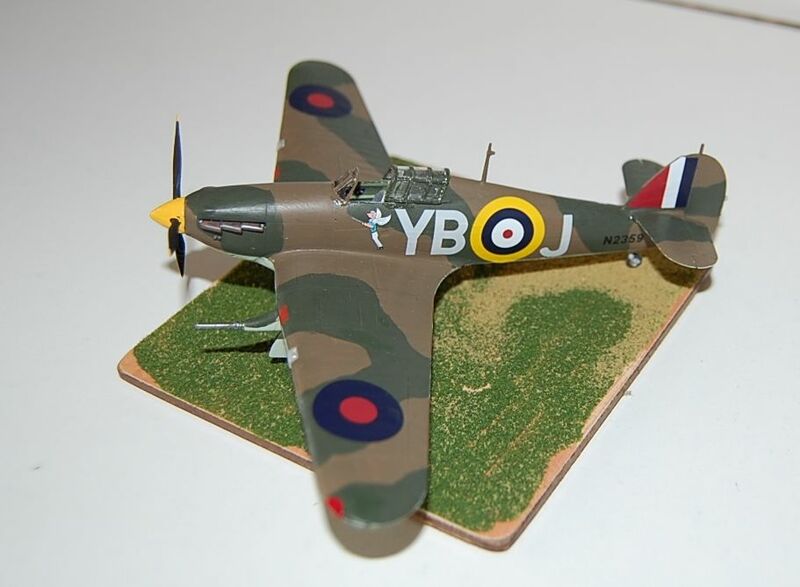 I have a couple of 1/48 Sea Hurricanes I'll be fitting with 2 x 20mm & 4 x .303cal (maybe 2 x .50cal, if I can be bothered doing even more mod work). As for the guns. Francis K Mason's book "The Hawker Hurricane" has a piece about them and their testing and they were Oerlikon's. Apparently they were relatively successful although the marked trim change after a burst of more than 2-3 seconds made aiming difficult and that combined with the Oerlikon's slow rate of fire meant a lethal hit on a target was considered unlikely. Interestingly the same piece says that a couple of the prospective overseas customers were interested in cannon armament but wanted it in the wings rather than pod mounted as per the RAF requirements. Apparently this was trialed but at the time the book was written no photographs had come to light. Thanks for the info Chris, I had this thought nudging the little grey cells that they were Oerlikon's. I'm getting back into modelling after quite a few years and would like to ask your method / materials for such a beautiful 'hard edged' camouflage ? I've got a Spitfire underway that really needs this. I use acrylics, simply because they are easier to clean up and dry faster. As for brand ? It's normally stated in my build posts. I still brush paint and I'll paint the underside first, usually because it's the lightest colour. I then mask that off, if it requires a hard edge. RAF types do, other countries types sometimes don't. Be careful with the masking tape as some brands will pull paint off. I use Tamiya. As for the top colours ? I'll paint the lightest colour first, the brown in this case and then I'll paint the green, all freehand in the case of RAF types. Where a nation used hard edge camouflage, Luftwaffe splinter, then I will mask the lighter colour off. If brush painting then buy the best brushes you can afford, a nice selection of flat and pointed ones. Then keep them clean, sounds obvious, but it can be tempting to rush the cleaning. The only thing I would say is that some acrylic paint manufacturers now produce "air brush ready" paints. You can still brush paint with them, but you need a lot more coats. With standard paints I can normally with brush I can get away with 2/3 with a little thinning.